The Exxon Valdez was a supertanker carrying approximately 55 million gallons of oil when it ran aground on a reef in Prince William Sound, Alaska, on March 24, 1989. At least 11 million gallons of crude oil spilled into the habitat for salmon, sea otters, seals and seabirds. As frequently happens when things go wrong, people immediately looked for someone to blame. They settled on the captain of the ship, Joseph Hazelwood. He was portrayed as a careless drunk who was singularly responsible for the disaster. In fact, he was the only person to face criminal charges. Before his trial, he claimed he had been “flushed down the toilet” by Exxon and was being made a scapegoat. Many agreed. Ultimately, Hazelwood was acquitted on all felony charges, but was convicted of a misdemeanor charge of negligent discharge of oil. 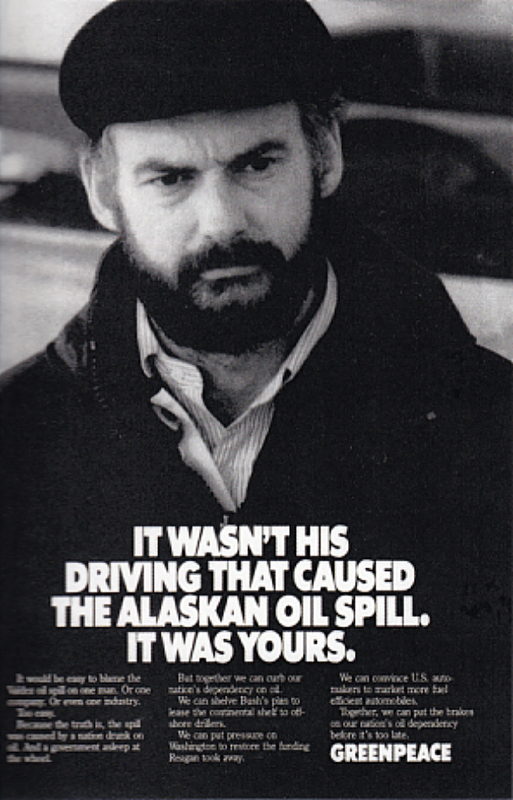 That makes for an effective ad — people recalled it decades later with the advent of the 2010 Deepwater Horizon oil spill. 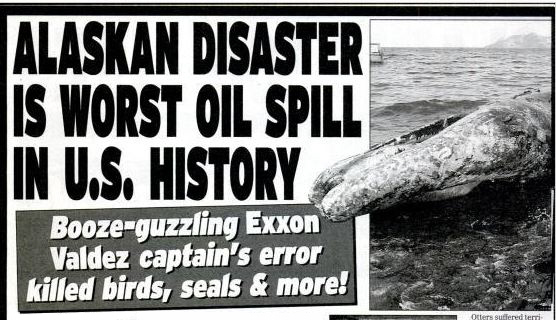 It would be easy to blame the Valdez oil spill on one man. Or one company. Or even one industry. Because the truth is, the spill was caused by a nation drunk on oil. And a government asleep at the wheel. But together we can curb our nation’s dependency on oil. We can shelve Bush’s plan to lease the continental shelf to off-shore drillers. We can put pressure on Washington to restore the funding Reagan took away. We can convince U.S. automakers to market more fuel-efficient automobiles. Together, we can put the brakes on our nation’s oil dependency before it’s too late.